Bovine respiratory disease is caused by several pathogenic organisms. It can lead to substantial economic loss in feedlots. Cattle must be vaccinated preventatively against bovine respiratory disease, while factors predisposing the disease should be eliminated. Bovine respiratory disease complex (BRDC), also called infectious bovine rhinotracheitis and bronchial pneumonia, is caused by a number of pathogenic viruses and bacteria. Negative environmental conditions that put an animal under stress cause its defence mechanism to function subnormally, and this plays an important role in the development of BRDC. The condition is especially common in animals exposed to long- distance transport stress, and for this reason is also called shipping fever. Of all feedlot diseases, BRDC causes the greatest economic loss. Although it affects mainly feedlots, it can also lead to economic loss in dairy farming. The viruses involved usually produce primary mild lesions, while secondary bacterial infection causes serious lesions. Many animals may die if not treated timeously. M. haemolytica, P. multocida and H. somni are the most important bacteria playing a role in the disease. Mycoplasma bacteria are isolated in 50% of pneumonia cases. two of symptoms developing. Should the infected animal survive, extensive damage to the lungs may remain. lungs, treatment is unlikely to be successful. Such animals generally appear weak and their production suffers. Predispositioning factors are weaning shock, abnormally dusty conditions, long-distance transport, a change in rations, poor ventilation, extreme fluctuations in temperature and humidity, as well as factors suppressing and depleting the animal’s energy reserves. These symptoms suppress the animal’s defence mechanism, creating favourable conditions for BRDC to develop. Pneumonia in cattle usually occurs 10 to 14 days after exposure to the abovementioned stress conditions. It may persist for two to three weeks after the first recorded case and up to half of a herd may be affected. typical in advanced cases. Acute BRDC may cause a bloody nasal discharge, the nasal area becoming dry and encrusted due to dehydration. Vaccinate cattle preventatively. Consult a vet about vaccination and how to treat infected animals. Animals suffering from pneumonia must receive antibiotics and supportive treatment for the best prognosis. Predispositioning factors must be eliminated or reduced. Within the first 10 days of calving, cows are normally under stress. Should a cow experience a reduction in feed intake and a negative energy balance, become depressed and dehydrated, or have a temperature of 40°C or above in the morning, it may be due to BRDC. Consult a vet for a diagnosis. Administer an antibiotic to eliminate M. haemolytica, P. multocida and H. somni. 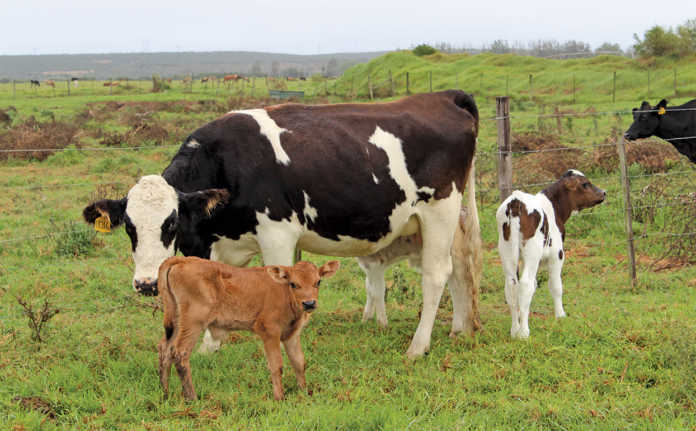 Email Dr Jan du Preez, managing director of the Institute for Dairy Technology, at [email protected], or Dr Faffa Malan, manager of the Ruminant Veterinary Association of South Africa, at [email protected].